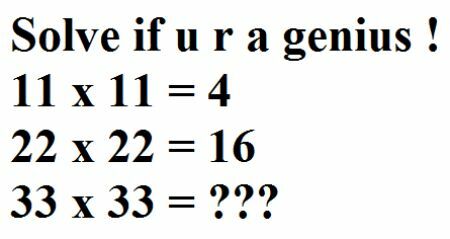 You know these internet memes that say if you can solve the question they ask, you are a certified genius? They seem to creep up on you no matter what you do to stop it. Often, the answer is obvious, however, I'd much rather expend my energy watching cat videos than proving my genius to everyone. Yes, just like that one. 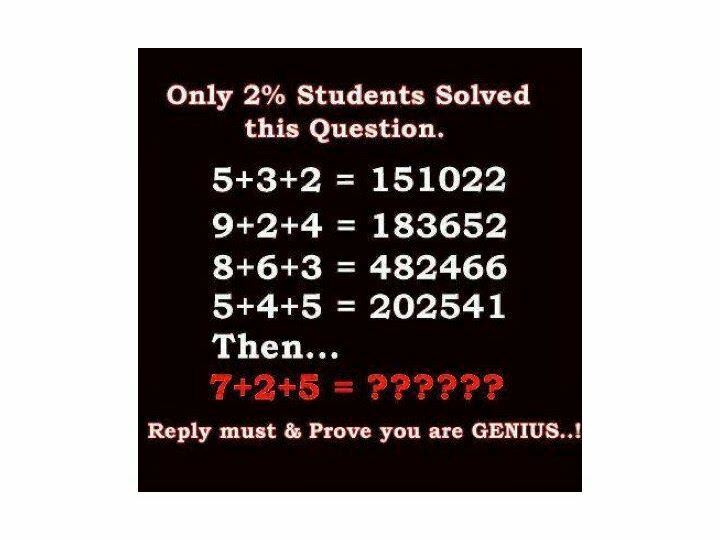 Now, if only there was a way to make a computer figure out the answer, so everyone would think that I'm a genius while I'm really just watching cat videos. This is exactly what we going to be doing today. Use various regression algorithms to solve internet genius memes. Understand how different algorithms can capture different relationships in the data. Using grid search to optimize multiple algorithms across a range of different parameters automatically. Note: This article builds upon what we learned in the previous post Creating Your First Classifier. If you're new to machine learning, and haven't yet read it, you should read it first before returning to this article. Luckily, many of these problems boil down to regression. We know some function inputs, and their outputs. Our goal is to find the function, so we can compute the function value for new inputs. Formally, we can say that we know x, and f(x) for some input x, and our goal is to find f such that we can compute f(z) where z is not in x. This is in essence what machine learning is all about. We mentioned that this was a regression problem, but how does that differ from a classification problem? Regression and classification are very similar in terms of goal; find f. However, the properties of f differ between them. Classification, as we saw in the previous post, can be used to determine, or classify, which of a finite range of groups our input x belongs to. For example, given the petal width and length, we can find which species the Iris flower belongs to. Regression, on the other hand, doesn't assign membership based on a finite set of categories. Instead, regression works across an often infinite number line. Furthermore, an acid test for whether you should use regression is to ask if two numbers close to each other are more alike than numbers further away from each other; in other words, if the distance between two numbers is significant. For example, if you're doing regression analysis over stock market prices, a price of 10.0 USD is quite similar to 10.01 USD, so here there's a clear significance to the numbers. However, when we are classifying Iris species, the categories 0 and 1 are no more similar than categories 0 and 2. For a more thorough explanation of classification, please refer to the previous post about classifying Iris flowers. While talking about regression in the abstract is great, and is valuable in its own right, knowing how to use it in practice is often just as valuable, and perhaps even more useful. We know there's a correlation between the numbers on the left side, and the answer on the the right side. However, we don't know how they are correlated. Let's examine what happens here? First, we import the linear regression model from sklearn with from sklearn.linear_model import LinearRegression. Next, we initialize the data; notice how we group the individual features in a list for example [5,3,2] is one set of features for which the label, or the correct answer is the train_Y value at the same index: 151022. We then initialize and train the model using the by now familiar sklearn syntax. Finally, we use the newly fitted model to predict, first one of the known examples to see if it works, and then the unknown test for which we see the answer is 107687. Usually in machine learning, you validate the model by segmenting your data into a training set, and a test set. In order to find the generalized accuracy then, you measure the model's accuracy on the test set which ideally contains samples which the model has never seen before. This method usually gives a good indication of how well the model will perform on real world data. However, for the internet memes, we have so few examples that we have to use everything we have during training. While this is would be a problem if we're trying to fit real world data where noise can occur from outliers, and fallacious measurements, it works for these internet memes due to two important properties. All the data is exact. All the inputs X, when run through f(x) always equals our value Y. The function that we are trying to find f(x) is explicit. That is it does exist, and is not a part of a probability distribution. This means that we can compute the accuracy from the same data which we use for training, and we know that we have found a correct relationship if and only if the accuracy computed is equal to 1. That is assuming it doesn't memorize the examples. Why is that? You might ask. The reason we can declare the internet meme correctly solved when the model is 100% accurate is because the meme only asks for a relationship, and not necessarily the same relationship that the original author intended as there's no way of proving what was intended. So as long as the model is internally consistent all the way through, it can be said to have discovered a true relationship. But isn't that cheating? You say. To answer this, allow me to pose an example. Suppose I gave you the following numbers [1,2,3,4,5,6,7,8,9,10,11,12], and I asked you to predict the next number based on the pattern. 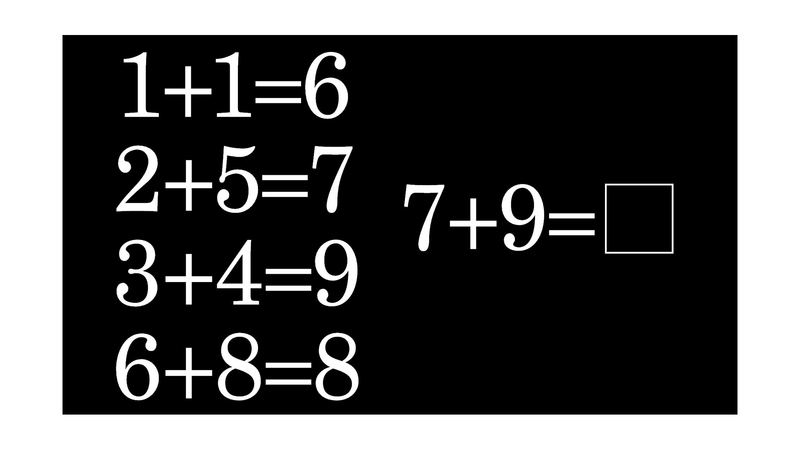 You might say 13, however, that is not the 'correct' solution; it is 1. You, quite reasonably, assumed that I was talking about the natural numbers series, but I was in fact thinking of the hours of the day on a clock where after 12, it loops back to 1. Does this make your answer incorrect? No, you had every reason to assume I was talking about the natural numbers, and your answer is consistent with the examples I gave you. You cannot be expected to read my mind, so as long as your answer consistent with the examples, it should be regarded as correct. This similarly applies to the internet memes, and the models. It's seen that the linear regression model does indeed capture a consistent relationship in the data which means that 107687 is a correct solution for the example. It's important, however, to note that there are often multiple correct answers. For this example, 143547 is also a correct answer for instance. Now, to be frank, linear regression is very simple, and I specifically picked this example to be compatible with linear regression. The truth is that most examples are not that easy, so we need more complex models. You may wonder why I only use one linear algrotihm; linear regression, while abstaining from similar algorithms such as stochastic gradient descent (SGD) linear regression. The reason is related to why we don't need to segment the data: Since we know that the function we are trying to predict f(x) is explicit, and that our data is exact, it serves no purpose trying to use a stochastic version that at best can predict the same as a ordinary least squares version (how the LinearRegression model is implemented). Similarily, we don't use logistic regression as we can assume that the function is continuous in the prediction space. That is the value we are trying to predict in the last example actually exists. Note further that we have to set n_neighbors to be equal to 2 instead of the default 5 for the k nearest neighbor regressor. This is because the algorithm cannot pick more unique samples than there are total samples for obvious reasons. We see that there are indeed multiple solutions to the meme that are all internally consistent evident by the accuracy of 1. Notice that we moved the prediction features into the variable pred_X. Running this, we once again see that there are multiple valid solutions namely 28 and 20. The models in sklearn usually comes with sensible default parameters, however, the default parameters are not always the best parameters for the problem. It therefore makes sense to tune the model in order to increase the chance of discovering a consistent pattern. Tuning all the different models manually would be a lot of work. Sklearn's gridsearch can, well, search through a series of parameters trying different combinations to see which ones have a better accuracy. Gridsearch is also useful in more traditional machine learning problems, but adds a lot of computational overhead as it has to retrain the model every time it a parameter i changed. It can therefore be beneficial to save to best model to disk. To recap, we have talked about the differences between classification and regression, and have learned how to use machine learning to solve internet memes. Finally, we explored one option for automatic optimization. Try to test the program on new examples found on the internet, or examples that we didn't try here. Find more relevant features to extend the gridsearch space. Try generating random values. Use the techniques you have learned here to solve numeric series such as the fibonacci sequence. You can access the entire source code base used in the tutorial here.